The Queen has offered her "sincere thoughts and deep sympathy" to the victims of Ireland and the UK's troubled past. At a banquet in Dublin Castle she said with hindsight "we can all see things which we would wish had been done differently or not at all". She went on to praise the "lasting rapport" now between the countries. 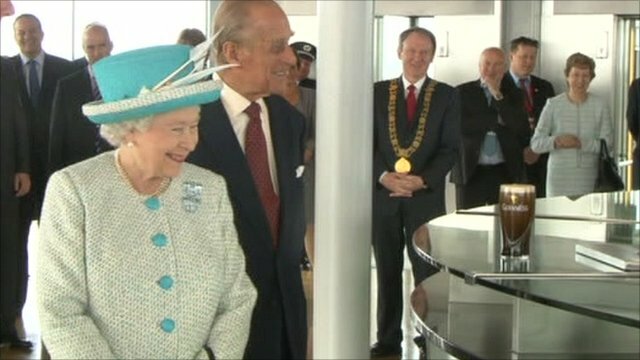 An apology was not expected, BBC royal correspondent Nicholas Witchell said, but the Queen came "pretty close". The Queen said that the two countries' relationship over the centuries had "not always been straightforward" nor "entirely benign". Nicholas Witchell said there was an "underlying sentiment of sorrow and regret" in the language of the speech, which was "a powerful expression, a personal expression by the Queen" and "a wish, finally to turn a page". Meanwhile, near the castle, police clashed with protesters opposed to the visit. The Queen is the first British monarch ever to visit the Republic. Earlier, she visited Croke Park sports stadium in Dublin, where 14 people were killed by British forces 91 years ago. On the second day of her visit to the Republic of Ireland, she also laid a wreath honouring Ireland's World War I dead. The Queen, wearing a dress adorned with 2,091 hand-sewn embroidered shamrocks, arrived at Dublin Castle, the former seat of British rule, with the Duke of Edinburgh by her side. The monarch opened her speech - made in the same room where Queen Victoria once dined - in Irish. "A Uachtarain agus a chairde (President and friends)," she said. She went on: "It is a sad and regrettable reality that through history our islands have experienced more than their fair share of heartache, turbulence and loss. "These events have touched us all, many of us personally, and are a painful legacy. We can never forget those who have died or been injured, and their families. "To all those who have suffered as a consequence of our troubled past I extend my sincere thoughts and deep sympathy." She added: "With the benefit of historical hindsight we can all see things which we would wish had been done differently or not at all." By opening her speech in Irish, the Queen delivered one of the most powerful soundbites of the peace process. "Wow" was how Ireland's President Mary McAleese responded as the British monarch spoke in the native Irish tongue. Open-mouthed, she said it again - "wow". It was only a couple of words, but by using Irish, the Queen demonstrated a respect for independent Ireland that helped to exorcise some of the ghosts of the past. The extended standing ovation for the speech showed how well it went down. 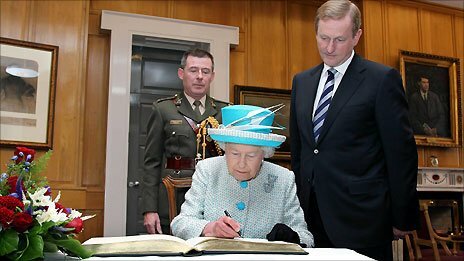 Never mind the King's Speech, the Irish history books will be more interested in the Queen's speech. The Queen praised President Mary McAleese - who was hosting the visit - who had "done a great deal to promote this understanding and reconciliation" and "set out to build bridges". The monarch also highlighted the legacy of the Good Friday Agreement whose success in helping to bring stability and peace to Northern Ireland had ultimately made her visit possible. She said the strong relationship between Ireland and Britain was reflected in the fact that many people in the UK had relatives across the Irish Sea - as many Irish families had close relatives in Britain. President McAleese, in her address to the state dinner, said a new chapter had been opened between Ireland and Britain. "The harsh facts cannot be altered nor loss nor grief erased but with time and generosity, interpretations and perspectives can soften and open up space for new accommodations." She said she was proud of Ireland's difficult journey to national sovereignty and a republic which asserted religious and civil liberty. "I am particularly proud of this island's peacemakers who having experienced first-hand the appalling, toxic harvest of failing to resolve old hatreds and political differences, rejected the perennial culture of conflict and compromised enough to let a new future in," she said. Outside Dublin Castle, members of the 32 county sovereignty movement, which opposes the Queen's visit, clashed with police in nearby Nicholas Street, the BBC's Ken Murray said. Five people were arrested. UK Prime Minister David Cameron was present at the state dinner, after earlier flying in and holding talks with the prime minister, Taoiseach Enda Kenny. "As so often, her majesty has been able to put things and say things and do things in a way that massively strengthens the relationship," Mr Cameron said. Mr Kenny said: "I think it was a remarkable contribution in what is a remarkable state visit. "I think people were very taken by the extent of her words and the clarity and ringing tone in which she said them." Sinn Fein president Gerry Adams, whose party did not attend the dinner, said he believed that the Queen's expression of sympathy was genuine. But he added: "Queen Elizabeth's acknowledgement that the relationship between Britain and Ireland has not been entirely benign is a gross understatement. "This will be forgiven if the future policy of her government is about building an entirely new future based on genuine equality, and mutual respect." In the afternoon, the Queen was welcomed in Croke Park by Gaelic Athletic Association president Christy Cooney, who said her presence was an "honour" and the visit would underpin and advance the peace process and "go down in the history of the GAA". On 21 November 1920, during the War of Independence, 13 spectators and one player were killed when British forces opened fire at a football match at the home of Gaelic sports. Earlier that day, IRA assassination squads had shot dead 14 suspected British intelligence agents in Dublin. Before going to Croke Park, the Queen laid a wreath honouring almost 50,000 soldiers at the Irish National War Memorial. The Queen leaves the Rock of Cashel after a tour of the historic monument. The Lord Mayor of Cork, Michael O'Connell, shows the Queen the best of Irish produce at the English Market. Wednesday 18 May: Tour of the Guinness Storehouse; visit the Taoiseach, Enda Kenny, at Government Buildings; wreath-laying ceremony at the Irish War Memorial Garden; Croke Park stadium to meet Gaelic Athletic Association; state dinner at Dublin Castle. Thursday 19 May: Visit to National Stud at Kildare. Friday 20 May: Tour of St. Patrick's Rock, Cashel and the English Market and Tyndall Institute, Cork.